1.1 Southwest Monsoon conditions prevailed in the first fortnight of September 2018. During the period, the monsoon rainband situated between latitudes 5°N and 15°N, brought rainy conditions to the northern ASEAN region. 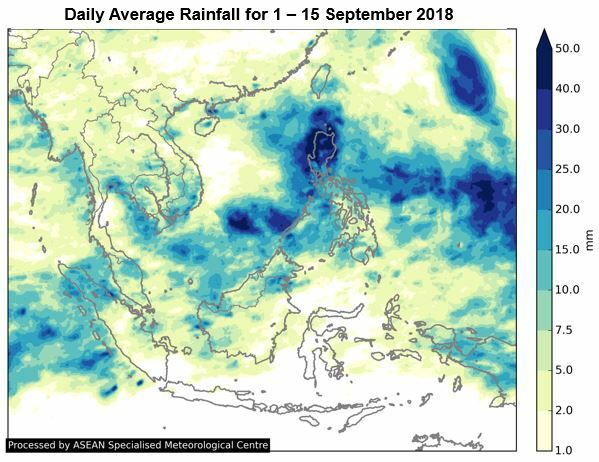 Near- to below normal rainfall was recorded over most parts of the northern ASEAN region, except for parts of Myanmar and southern Viet Nam where above-normal rainfall was received. The northern parts of Philippines received above-normal rainfall, contributed partly by the tropical storm activities during the fortnight. 1.2 In the southern ASEAN region, the incursion of dry air from the southern hemisphere brought dry conditions over most parts of the region. 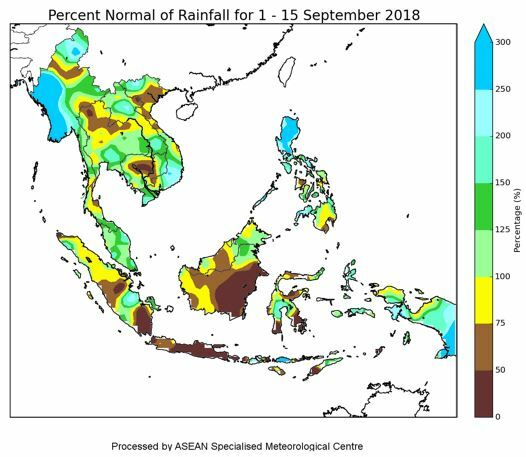 Most parts of the southern ASEAN region experienced below-normal rainfall, except for Peninsular Malaysia and the northern half of Sumatra where near-normal rainfall was received. 1.3 The daily average rainfall and the percentage normal of rainfall for the first fortnight of September 2018 are shown in Figure 1 and Figure 2. 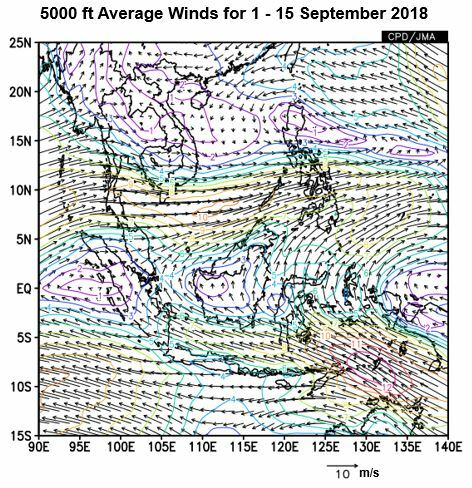 1.4 During the second week of September 2018, Typhoon Mangkhut, developed over the western Pacific Ocean and tracked west to northwestwards toward the Philippines. The storm intensified rapidly into a Super Typhoon and brought heavy rains accompanied by strong winds as it made landfall over Luzon, the Philippines on 15 September 2018. The rainband associated with the Super Typhoon brought wet weather over most parts of the northern ASEAN region, northern Peninsular Malaysia and northern Sumatra. 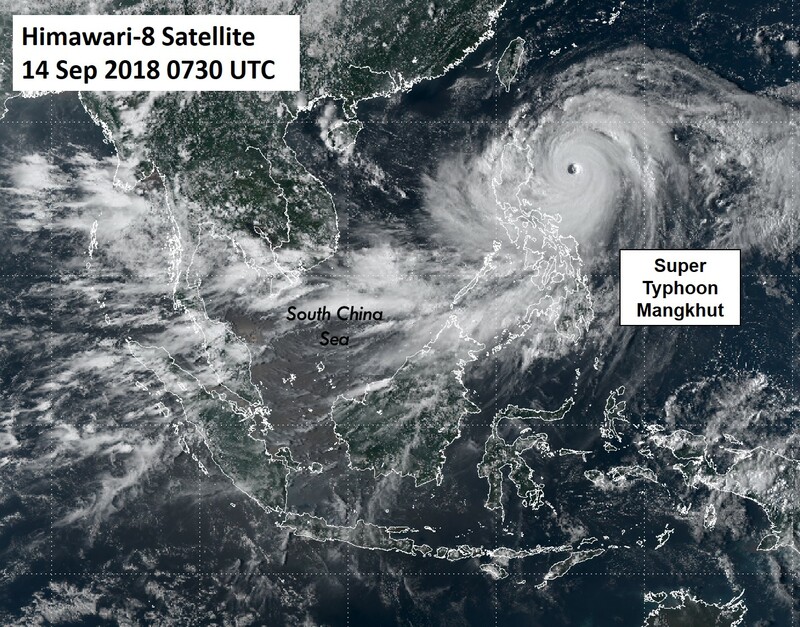 Figure 3: Himawari-8 image on 14 September 2018 shows Super Typhoon Mangkhut over the western Pacific Ocean before it made landfall in the Philippines. 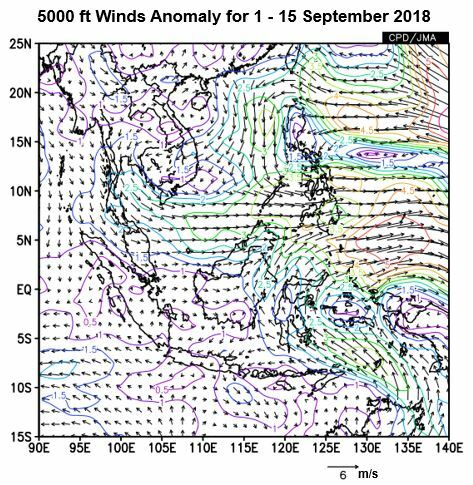 1.5 During the first half of September 2018, anomalous northwesterly winds were observed over southern Thailand and Peninsular Malaysia while over the South China Sea, slightly stronger than usual westerly winds were observed. The anomalous winds were due to the influence of Super Typhoon Mangkhut, as well as Typhoon Jebi (Typhoon Jebi developed in the Pacific Ocean and affected Japan). Figure 4 shows the average and anomalous winds at 5000 feet. 1.6 During the period, the sea surface temperatures were observed to be warmer than average in the central and eastern Pacific Ocean, and the trade winds were observed to be slightly weaker in the western Pacific Ocean. However, the El Niño-Southern Oscillation (ENSO) continued to remain in the neutral state (neither El Niño nor La Niña). 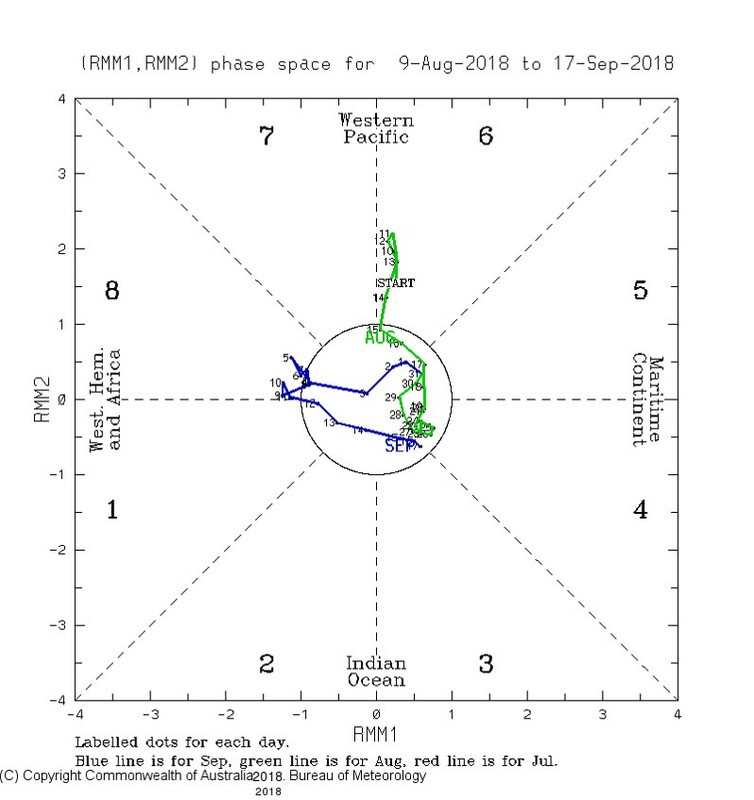 1.7 The Madden Julian Oscillation (MJO) signal was generally weak and non-discernible during the first fortnight of September 2018, and had little or no influence on the weather in the region.